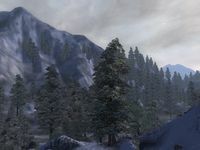 The Jerall Mountains (sometimes spelled Jeral Mountains) is a mountain range in northern Cyrodiil. Skyrim borders on the north. It shares a border with the Colovian Highlands to the west, and the Great Forest and Nibenay Basin to the south. To the east, the mountain range merges with the Valus Mountains. Some notable mountains in this range are Gnoll Mountain and Dive Rock. Travel through the Jerall Mountains can be difficult, with many steep mountainsides and glaciers. However, there are several unmarked roads that facilitate travel in this area. Most of the sites of interest in the Jerall Mountains are along or near one of these unmarked roads. 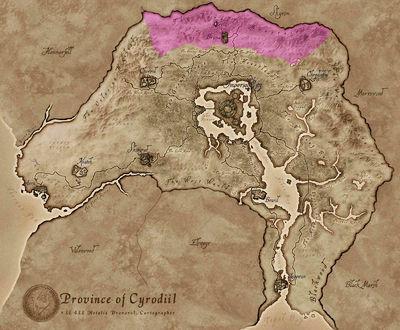 The largest city in the Jerall Mountains is Bruma. Cloud Ruler Temple is also located here. The flora of the region is more extensive than one might first suppose for such mountainous land, although it consists largely of hardy plants able to survive in the cold. Clouded Funnel Cap mushrooms, Lavender, Milk Thistle, Motherwort and Tinder Polypore Cap mushrooms all grow here, and Wormwood is unique to the region. A list of places found in the region of Jerall Mountains. A list of all quests involving the region of Jerall Mountains. This page was last modified on 7 October 2018, at 18:57.